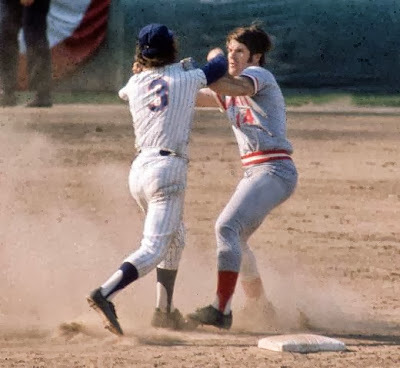 centerfield maz: Remembering Mets History (1973): NLCS: Game #3- "The Bud Harrelson Pete Rose Fight"
Remembering Mets History (1973): NLCS: Game #3- "The Bud Harrelson Pete Rose Fight"
With the series tied at one game each, as 53,967 fans came out to a fired up Shea Stadium on a beautiful; autumn, Monday afternoon in New York. 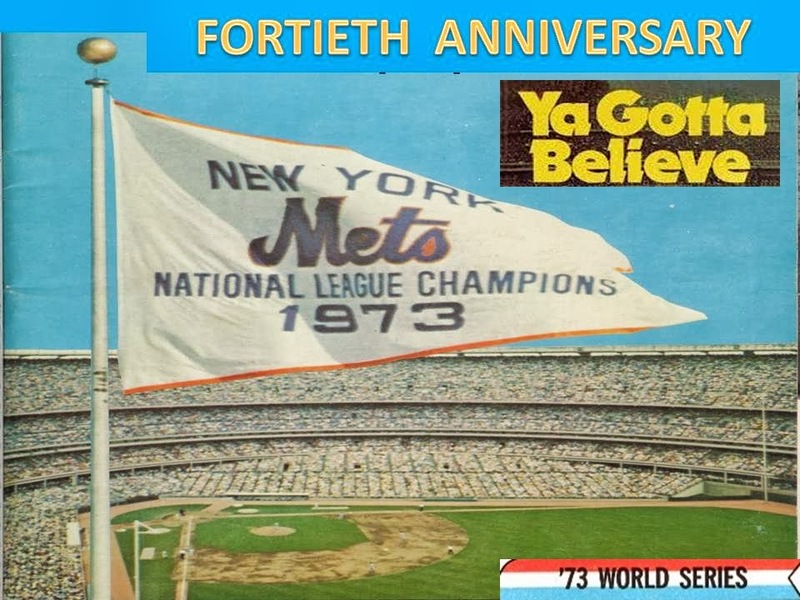 It had been just four years since the very first NLCS in history was played here at Shea Stadium, as the 1969 Amazing Mets beat the Atlanta Braves to advance to their improbable World Series win. T Now in 1973, there was plenty of excitement in the air. During batting practice, The Reds Joe Morgan approached Bud Harrelson at the batting cage, commenting on the remarks Harrelson made after Game #2. Harrelson had told the press "the Reds look like him out there hitting". Morgan grabbed Buddy by the jersey, saying “If you ever say that about me again, I’ll punch you”. The Mets Rusty Staub intervened, he knew Morgan since their days together in Houston with the Astros. Morgan cooled off after talking with Staub, apologizing, to the Mets team mates. Morgan said that Pete Rose is not going to be as forgiving & will use the comments to try to fire up the Reds team. The Mets principal owner Mrs. Joan Payson threw out the ceremonial first pitch & it was on to baseball. Today's starters were the Mets lefthander; Jerry Koosman (14-15 / 2.84 ERA / 156 Ks/ 12 complete games / 3 shut outs). Since mid August he was 6-1 with a 1.16 ERA in that time, including setting a Mets record for scoreless innings. For Sparky Andersons Reds it was Ross Grimsley (13-10 / 3.23 ERA / 90 Ks / 8 complete games). It was to be a memorable afternoon. 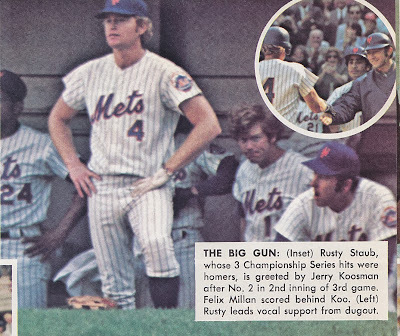 In the home 1st, Rusty Staub started his big day at the plate by putting the Mets on the board with a solo HR. In the Mets 2nd they exploded with four hits & four runs, running away with the game. Jerry Grote walked & Don Hahn drove a single to right field. Bud Harrelson then lined out to right for the first out. 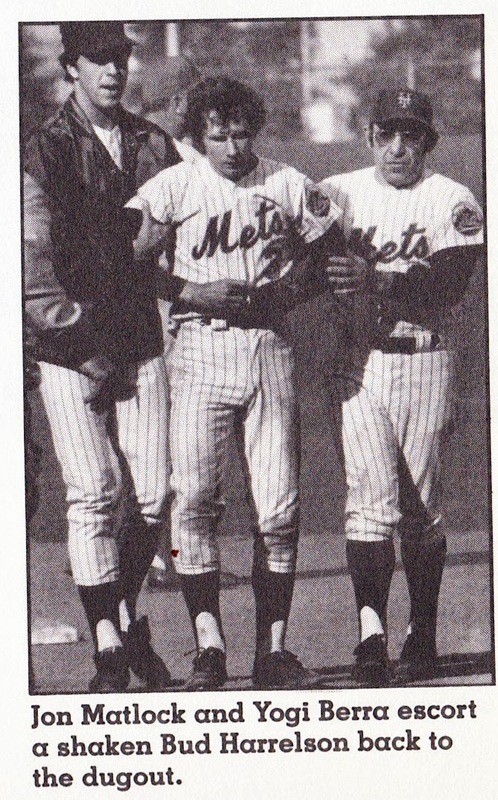 The pitcher Jerry Koosman also singled, but Grote was unable to score as the bases were loaded. Wayne Garrett flew out to center but this time Grote did score & it was RBI sac fly, 3-0 New York. Felix Millan who had set a Mets regular season record that year with 185 hits, singled to right bringing in Hahn with the fourth run. Sparky Anderson was done with Grimsley & brought in Tom Hall (8-5 / 8 saves / 3.47 ERA) to face Staub. Rusty Staub was the Mets biggest run producer of the year & one their most clutch hitters. His 76 RBIs led the team & his 15 HRs were third to John Milner (23) & Wayne Garrett (16). Hall delivered the pitch & Staub blasted it down the first base line, and the ball hit off the auxiliary scoreboard for a three run HR. The Shea fans went wild roaring as Staub quickly rounded the bases. It was now 6-0 New York. He had already hit a HR in Game & now had his second HR with his fifth RBI & was batting .300 in the playoffs. In the top of the 3rd, Dennis Menke hit a solo HR off Koosman putting the Reds on the board. After Darrel Chaney popped out, Larry Stahl, Pete Rose & Joe Morgan hit consecutive singles. Morgan's hit brought home the Reds second run, it was 6-2 New York. In the bottom of the 3rd, Reds left hander Dave Tomlin (1-2 / one save /4.88 ERA) replaced Hall on the mound. He was greeted with a Jerry Grote base hit. He would advance & score as pitcher Jerry Koosman singled to right field. Koosman had hit .103 in the regular season with three RBIs. In his 12 year Mets career he batted .121 with 2 HRs & 39 RBIs in 807 at bats. In the home 4th, Felix Millan drew a walk & with one out, Cleon Jones doubled to right field bringing Millan home. Next, the Hammer; John Milner drove a base hit to right making it 9-2 New York in a wild Shea Stadium. The Mets were on the verge of pulling ahead in the Series & being one game away from the World Series. 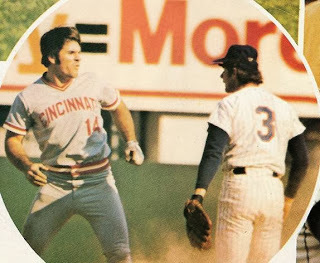 This wasn't sitting well with the Reds, who were getting very frustrated, especially Pete Rose. From the dugout, Tom Seaver was keeping a close watch on Pete Rose. 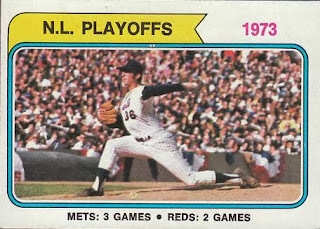 Jerry Koosman claims he also got Rose fired up earlier in the game. 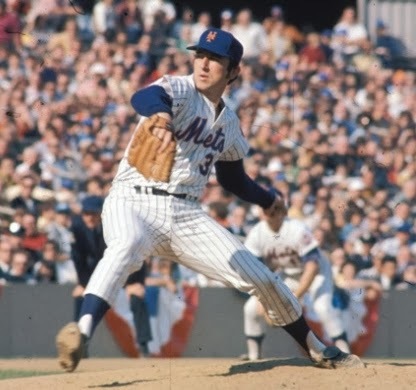 Rose knew Koosman was a hard thrower at times, but he was trying to keep the ball down & away with slow curveballs. 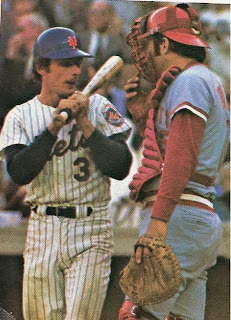 After his first at when he popped out, Rose got back to the dugout yelling at Koosman, "throw the ball you big, dumb donkey". 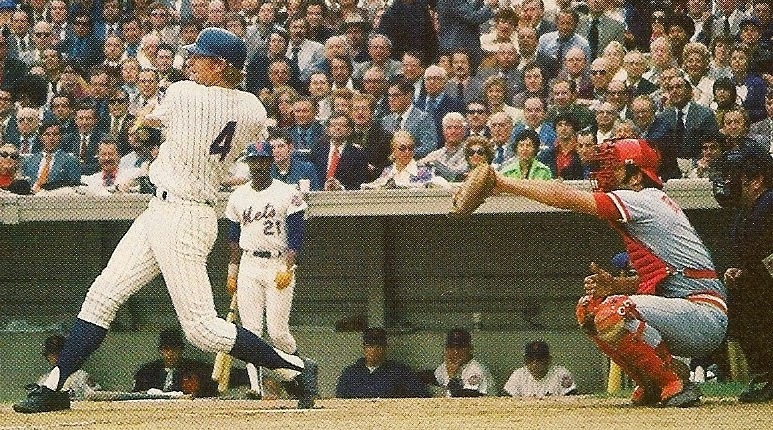 Koosman heard him over the noisy crowd but never looked over. When Rose came up later, Koosman tried to drill him with fastballs four times, but Rose got away each time. Tom Seaver recalled. "You knew somehow, somewhere Pete was going to do something. " 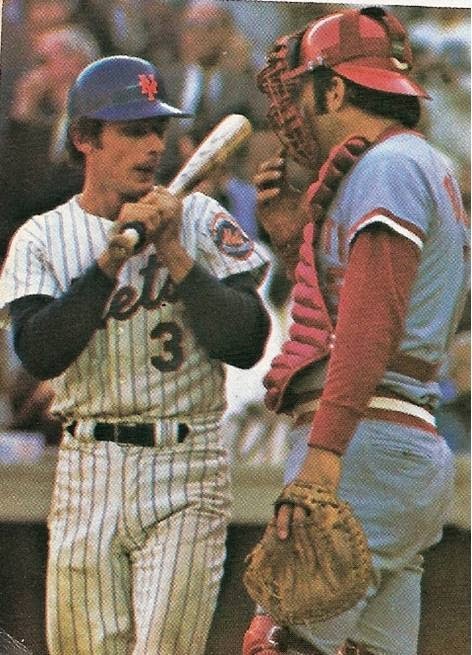 Now Koosman almost hits Pete with a pitch, and I thought to myself; he's going to go to the mound after Jerry. He started on the grass, and then he came back to the baseline and went directly to first base." In the 5th inning, Rose got aboard with one out. 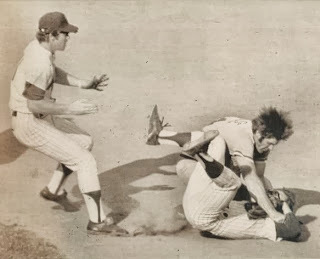 The next batter was Joe Morgan who grounded to Millan, into a 3-6-3 double play completed by John Milner at first base. At second base Pete Rose goes in hard, with a pop up, cheap shot slide into shortstop; Buddy Harrelson. The two exchanged words as Harrelson called him a "cheap shot @#$% sucker". It was what Rose wanted, he grabbed the skinny Harrelson by the top of his jersey, and threw him to the ground, jumping on top of him. 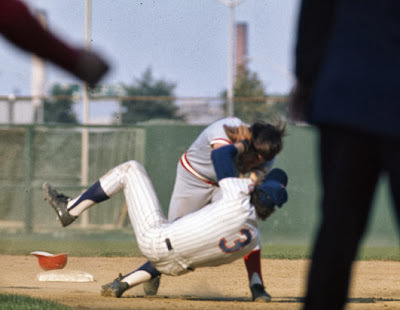 In the word of Mets announcer Bob Murphy-"Rose outweighs Harrelson by about thirty five pounds..." The overall reaction was Rose was acting like a big bully, picking on the much smaller short stop shortstop. Mets Third baseman; Wayne Garrett came over from his third base spot, jumping on top of Rose to try to pull him off of Harrelson. Then all hell broke loose at Shea Stadium, on & off the field. It was the third out of the inning, so players were on their way to the dugout, focused on jogging away from the field. When everyone realized what was going on, both benches emptied, as well as the teams respective bull pen's. There was a lot of pushing, shoving & milling around in the infield for a bit. 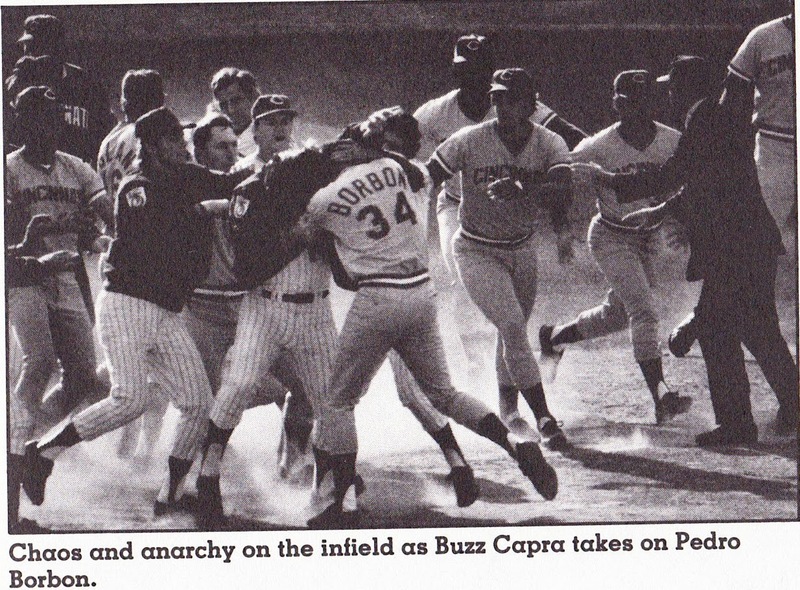 Then Reds reliever; Pedro Borbon, landed a sucker punch from behind to the head of Mets pitcher; Buzz Capra. Capra attacked Borbon, as backup catcher Duffy Dyer, got in some retaliatory punches of his own, before being pulled out of the melee by Willie Mays. As Borbon left the field, he picked up a cap & put it on his head, thinking it was his. To the crowds delight, it was a Mets cap, when Borbon finally figured it out, he pulled it off his head and took a bite out of it, then threw it down. It was Buzz Capra's Mets cap & he claims to still have it to this day. When order was finally restored on the field, the game continued, with Rose returning to his position in left field. 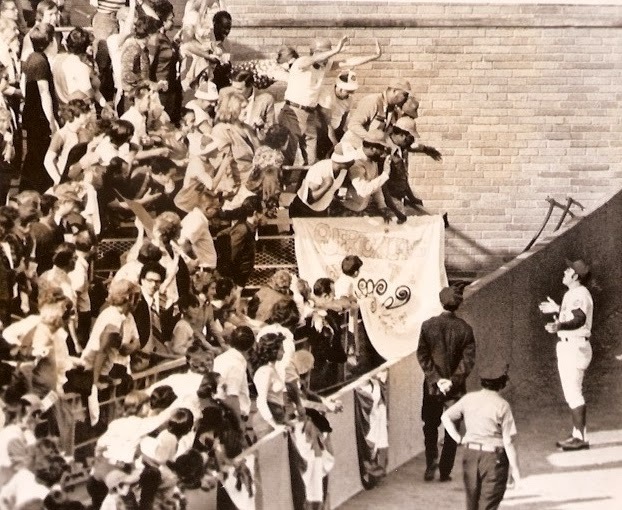 But now it was chaos in the stands, especially overlooking left field. The Shea Faithful let Rose know how they felt & they weren't nice about it. The scene got very ugly & dangerous, as the Mets fans let Rose have it. A variety of objects showered down from the upper deck, anything from papers, programs, hot dogs, beer cups, batteries, and finally a whiskey bottle. The bottle landed just a few feet away from Rose, just missing his head during Felix Millan's at bat. Rose showed the low class he had, by actually tossing some stuff back. He never never thought he could have hurt an innocent child or innocent bystander. But times were different in 1973 & no action was taken against him. Rose called time & walked toward the infield, informing Umpire Ed Sudol & his manager; Sparky Anderson. The Reds Manager Anderson, went to the umpires to stop the game, claiming it was too dangerous for his team on the field. The Reds were pulled from the field. 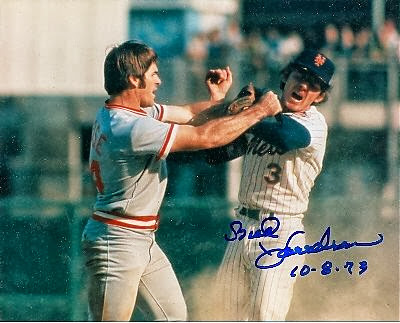 Anderson said; “Pete Rose gave too much to baseball to die in left field at Shea Stadium”. The umpires met with NL President Chub Feeney, who was in attendance at the game and came to a decision; that the game may have to be forfeited unless order was restored in the stands. At risk of losing a playoff game in which they had a seven run lead, the Mets sent a peace delegation to left field. Tom Seaver, Rusty Staub, Cleon Jones and Yogi Berra walked out to left field, pleading with the rowdy fans to calm it down. The New York fans cheered, as their team walked out to left field and obeyed their request. Cleon Jones said " the fans hadn't seen Willie in quite a while & were happy to see him". At first the team thought Berra & Mays would be enough, even NL President Chub Feeny agreed. 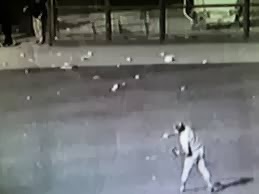 He thought if he went out there that they'd throw things at him too. He even considered sending Tom wife; Nancy Seaver out there as a peace maker, since she was so loved in New York. Feeny said he thought of it, but didn't know where she was sitting. Order was soon restored enough to continue the game. 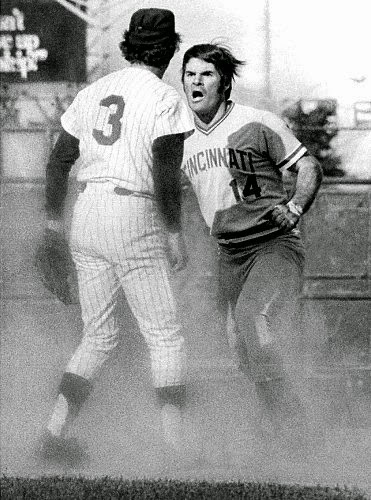 Pete Rose was booed mercifully, upon his return to the field. 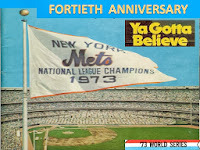 From that day on it would be that way for him at Shea Stadium & for Met fans (like myself) we have never forgiven him. Bud Harrelson quickly became Americas favorite little guy, underdog hero. Harrelson was already an All Star short stop because of his outstanding defense. This in an era when short stops were smaller guys who were not known for hitting. Harrelson was among the best of the lot. Any Mets pitcher of his era, always said Harrelson stopped many huts from getting through & was the anchor of the infield in 1969 as well as in 1973. The Mets rolled along to the 9-2 victory. Koosman went the distance in another fine post season performance, his third career post season win with out any loses. He allowed two earned runs, on eight hits without any walks. Along the way he struck out nine Reds, including rookie Ed Armbrister three times. Offensively it was Staubs day, two hits both HRs & four RBIs. John Milner, Felix Millan & Koosman himself all had hits with RBIs. Wayne Garrett added an RBI & Don Hahn & Cleon Jones both had two hits apiece. The Mets took a 2-1 lead in the championship series, on their way to the World Series & another pennant. Maz, an absolutely priceless recounting for a then 12 year old kid who was sitting up in the nosebleeds that day with his father and brother, watching the entire thing unfold before his eyes. Thanks for stirring my memories of that day --- Kenny.